Baylor will be a community recognized for Transformational Education... Where academic excellence and life-changing experiences ignite leadership potential that increases our students' desire for wisdom, understanding of calling, and preparation for service in a diverse and interconnected global society. Baylor has a long tradition of excellence in undergraduate education in the liberal arts and in its professional schools. During the last decade, we have enhanced academic opportunities for undergraduates in many ways, including establishing an Honors College, creating a School of Social Work, and strengthening our faculty ranks in size, breadth, and quality. We have also strengthened graduate studies and post-baccalaureate professional education. Our Graduate School has grown with the addition of 43 doctoral and master’s programs, many of which have achieved recognition with respect to research productivity and student placement. Our professional schools added faculty, realized continuing success in both traditional and expanded programs, and provided first-rate facilities. We are in a position to build upon those strengths and to make significant new strides in the sciences and engineering. All of these pursuits must be undergirded by attention to the effective recruitment and retention of a diverse student body, coupled with scrupulous care for the development of competencies they will need to succeed and flourish in the 21st century. Utilize technology strategically and selectively to enhance the university’s learning environment and educational offerings. Ideas exchanged, experiences shared, and relationships developed on campus are the heart of the Baylor experience. Our students’ educational experiences must connect their academic and creative strengths to a world beyond the classroom. In particular, students should be inspired to connect their classroom learning to experiential opportunities that promote meaningful reflection and action. Experiential learning opportunities develop Baylor students into leaders who can help resolve challenging problems in our state, nation, and world. Student life has long been a vibrant part of a Baylor education. Experiences in the residential halls, on the intramural and intercollegiate athletic fields, and within student organizations encourage friendships, cultivate trust, and promote understanding and respect that transcend cultural and socioeconomic differences. During the past decade, stronger, more coordinated ties between student life and academic affairs have been forged to create a more holistic experience for students. 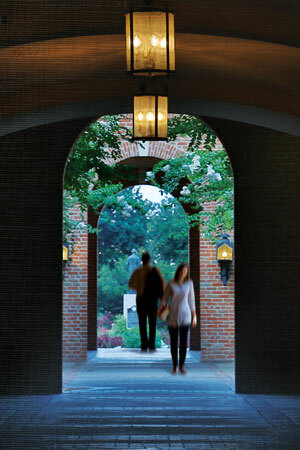 Perhaps most visible among our initiatives has been the creation of several living and learning communities and two residential colleges in which faculty live among students in communities that are bound together by academic, developmental, and spiritual pursuits. The success of these initiatives has led to plans for the East Village, a multi-phase residential community that will serve as a bridge project between Baylor 2012 and Pro Futuris. Affirm our commitment to sponsoring an NCAA Division I intercollegiate athletic program dedicated to academic and competitive integrity and a winning tradition across the full spectrum of men’s and women’s athletics. We understand leadership as one’s ability to influence others while maintaining a commitment to doing what is right and good, even in the face of competing priorities. Over the course of our history, Baylor graduates have held leadership positions across a broad spectrum of fields including law, business, industry, the arts, education, religion, medicine, and public service. Many graduates have also chosen to live out their calling in contexts that are not typically associated with leadership, but for which the qualities possessed by effective leaders are still valuable and relevant. We will continue to graduate students who are prepared and committed to influence the world through intercultural understanding and ethical and compassionate service to others. Expand opportunities for our students to engage with community, state, national, and international leaders.